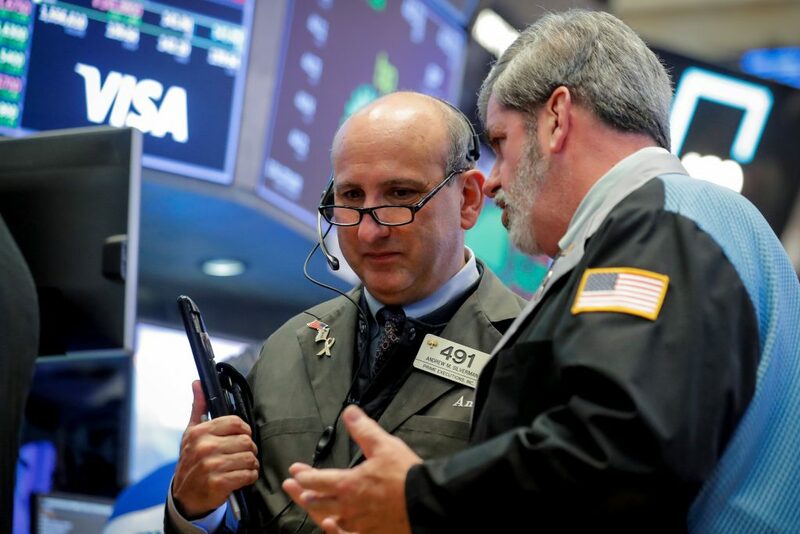 U.S. stocks rose broadly on Friday – driven by the consumer-staples sector, which was helped by Procter & Gamble results – brushing aside growth-risk concerns in Europe and political tensions in Saudi Arabia. Consumer-goods bellwether Procter & Gamble reported a surprise rise in first-quarter sales, sending its shares up 6.8 percent and boosting the consumer-staples index by 1.8 percent. The sector, which has largely underperformed the broader S&P 500 this year, was set for its biggest daily gain since June 2016. Analysts also said that China’s move to calm its markets, with regulators pledging to enact measures to help ease corporate-financing problems, helped improve sentiment globally. “The fact that China is supporting its market is a comfort for the U.S. That combined with strong earnings is giving a bit of a breather from macro events,” said Tony Roth, chief investment officer at Wilmington Trust in Wilmington, Delaware. At 11:34 a.m. ET, the Dow Jones Industrial Average was up 90.67 points, or 0.36 percent, at 25,470.12, the S&P 500 was up 12.99 points, or 0.47 percent, at 2,781.77, and the Nasdaq Composite was up 34.52 points, or 0.46 percent, at 7,519.66. U.S. stocks fell more than 1 percent on Thursday, weighed down by the European Commission’s warning to Italy and U.S. Treasury Secretary Steven Mnuchin’s decision to pull out of an investor conference in Saudi Arabia. Friday’s rebound was also driven by a 1.7-percent gain in Apple, after the company began taking pre-orders for its new iPhone XR and on Wedbush’s “outperform” rating. Among gainers on strong results was PayPal, which rose 9.2 percent and was on track for its best daily gain in two years after the payments company beat quarterly profit estimates. Schlumberger rose 1 percent as its third-quarter profit increased on higher oilfield-services demand. Honeywell shares pared earlier gains to edge 1.7 percent higher as the industrial conglomerate said it was seeing slower growth in China and that trade tariffs would squeeze margins and potentially cost it “hundreds of millions” of dollars in 2019. “Potential slowdown of global growth due to tariffs between the U.S. and other countries is really very concerning,” Roth said. Earnings growth for S&P 500 companies is expected to have increased 22.2 percent in the third quarter, according to Refinitiv data. Of the 84 companies that have reported earnings so far, 78.6 percent have beaten expectations. Advancing issues outnumbered decliners for a 1.62-to-1 ratio on the NYSE and a 1.02-to-1 ratio on the Nasdaq. The S&P index recorded seven new 52-week highs and 27 new lows, while the Nasdaq recorded 10 new highs and 100 new lows.